PRESS RELEASE: "Cartoon sensations Gorillaz have just been confirmed as Friday night headliners at this year's Glastonbury Festival, stepping in to fill the slot vacated by U2's late withdrawal. So what better time to catch up with the band's synth and sampling specialist Jesse Hackett? The Gorillaz recently released third album, Plastic Beach, focuses on the cartoon band's retreat to an island made of washed-up detritus floating in the furthest place from land in the middle of the South Pacific. It enabled Damon Albarn and cartoonist Jamie Hewlett to continue the story of the characters Murdoc Niccals, 2D, Russel Hobbs and Noodle, while subtly commenting on the culture of celebrity and waste in society. Co-ordinating an album starring a cast of cartoon characters and a host of celebrity guests is no mean feat, but to tour the album Albarn and Hewlett had to put together a live band capable of re-creating all the sounds on the record. Key to this was Jesse Hackett on synth and sampling duties, using a Moog Little Phatty and a sampling keyboard. Jesse met Damon while recording his second album with band Elmore Judd, on Honest Jon's Records, a label co-owned by Albarn. Jesse did a bit of playing on demos for the Gorillaz stuff before being invited to be part of the live band. Touring with the Gorillaz has meant putting Jesse's other band on hold, but it's also given him an opportunity to flex his chops in front of many of the biggest crowds he's ever played to. Jesse's live rig is relatively simple: he combines synthesised sounds from the Moog Little Phatty with sampled sounds. 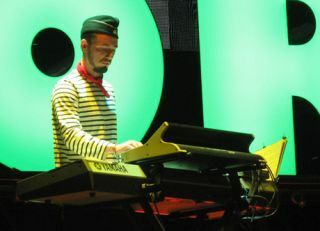 As well as its great sounds, Jesse has also been impressed with the Moog's reliability on tour. "We've taken all the sounds from Damon's studio, from all his analogue synths and sampled them onto a massive sampler keyboard. I use the Moog for quite a lot of bass sounds." An example of this is on the track Empire Ants that Jesse describes as "a wicked acid-y rare groove kinda tune with a great acid bass line." Interestingly, for the bass sound on this track Jesse found himself using one of the Little Phatty's presets. "My other keyboard has been a bit of a pain," he says. "At Coachella it froze - just one song in to the set, and starting acting weird. "It was pretty terrifying, I was up there about to do the biggest gig of my life, in front of 100,000 people, with Jay-Z and Beyoncé in the front row and the keyboard went all glitchy. "But the Moog Phatty has been completely reliable - I haven't had any problems with it at all. You just turn it on and get great sounds, it's very easy to use and manipulate, and the oscillators and filters are straightforward. "The sound always cuts really well in the mix, the bass-lines always stand out and you can get really nice lead patterns." To read the full interview with Jesse Hackett, visit the Source homepage.